You’ve probably spent time thinking about how to get more people to come to your website. Maybe it’s from spending some money on Facebook ads, or optimizing your content for search engines, or directing folks to your blog through an email newsletter. If you’re interested in growing your audience, some kind of marketing is critical. If you’re spending any time on marketing, you should also be spending time making sure that your marketing is actually working. That means figuring out if more people are coming in from Facebook, or organic search, or email links. The best way to do that is by tracking your traffic sources, which you can do through Google Analytics. Google Analytics can be pretty overwhelming. You log in, and suddenly you’re bombarded with a full page of charts, graphs, and numbers, numbers, numbers. How do you decode it to tell you something useful? Is it even worth it? Our answer to “Is it worth it?” is a definitive yes. Even a basic understanding of Google Analytics will give you a more robust understanding of who is visiting your site, where they’re coming from, what they’re looking for, and whether they find it. Knowing who uses your site and how means that you can make continuous changes to better serve your desired audience, and to more effectively accomplish your goals. When you effectively dial in your traffic report, you can know what percentage of your traffic comes from social (and which channels), what percentage comes from search engines, what percentage comes from email, and what percentage comes from paid acquisition. But often, Google Analytics’ traffic report groups your traffic in large–even inaccurate–categories. So what’s the solution? That’s where setting UTM parameters can help. UTM parameter can help you make better sense of where your traffic is coming from, and lets you dial in on the effectiveness of particular campaigns. They also help to break up the large chunk of traffic that often gets labeled “Direct” in Google Analytics into more specific sections, which can give you a more clear picture of your website’s users. What do UTM parameters do? They give you a better picture of where your traffic is coming from. They are codes appended to URLs that give you more information about where/how traffic originated. They must be individually built for each medium/source/campaign prior to sharing the campaign. How can they be built? 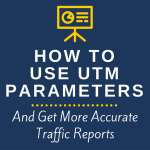 There are five different UTM parameter categories. They are: “Campaign source,” “Campaign medium,” “Campaign content,” “Campaign term,” and “Campaign name.” Source, medium, and name are all required. Content and term are optional. You can use either the Google URL builder or the Effin Amazing Chrome Extension to build the URL. Both of these walk you through the steps of building the URL, and then generate it for you. The Chrome Extension has the benefit of not requiring opening another tab/window. You should keep your parameters consistent to avoid having a bunch of redundant tags. UTM parameters are case-sensitive. Best practice is to use only lowercase letters. “Campaign term” should only be used for paid AdWords campaigns. “Campaign content” can be used if you’re A/B testing content. “Campaign name” should be a recognizable description of the campaign you’re running. Refer to the lists below to find which “Campaign source” and “Campaign medium” parameter works best for your URL. You can create your own “Campaign name” parameter, but make sure it’s descriptive of the campaign. Campaign source=social, campaign medium=facebook, campaign name=cutest puppies. 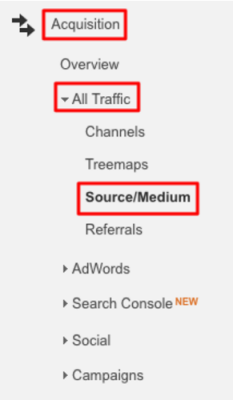 This info then appears in Google Analytics under “Acquisition” → “All Traffic” → “Source/Medium.” Now you can dial in on which social channels are giving you the most traffic on which campaigns. As with all marketing/analytics data, UTMs are not a silver bullet. URLs that are shared by copy/pasting can lead to misleading UTM parameters, but stripping the parameters after sharing can mean that traffic appears to be direct when it was really from sharing (source). So, UTM parameters will not result in a perfect solution to figuring out traffic sources–but it should get closer to painting an accurate picture of traffic sources. Now you can go forth, create your own UTM parameters, and feel secure that your traffic will be more accurately recorded in Google Analytics! Have any questions? Feel free to leave them in the comments, and we’ll answer them for you.